A taxi driver was arrested at a car wash after police said a cab struck a pedestrian in Millbrae. Robert Handa reports. A taxi driver was arrested at a car wash after police said a cab struck a pedestrian in Millbrae. 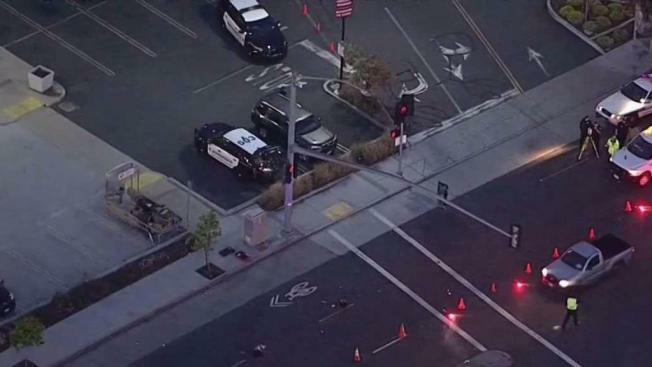 A pedestrian was crossing the street in the area of El Camino Real and Silva around 4:56 a.m. Friday when the taxi cab struck, San Mateo Sheriff's office said. The victim has only been identified as a 38-year-old woman. She sustained "major injuries," according to officials. She was taken to a local hospital where she is in critical condition, police said. Burlingame Police took the suspect, identified as 55-year-old Teodoro Garcia of Daly City, into custody as he was entering a carwash, the sheriff's office said. The Sheriff’s Office Major Accident Investigative Team and the Sheriff’s Office Detective Bureau are investigating the incident. They are not sure why Garcia ran away and whether alcohol or drugs played a part. “To provide help for anybody is better than doing nothing and it’s certainly better than fleeing the scene,” said Blankswade. Garcia faces hit and run and destruction of evidence charges, officials said. If the victim does not survive, he could also face homicide charges. Officials have asked anyone with information to contact the San Mateo County Sheriff’s Office Detective Bureau, Detective Hui at 650-363-4066 or the anonymous tip line at 800-547-2700.